If I got my iPhone stolen, I'm not sure I would have been as quick on my feet as TUAW reader, Rob. Apparently, Rob had his iPhone stolen near his home in Kennesaw, Georgia. Bummed, but unphased, Rob headed down to his nearest Apple Store to buy a new one. However, the next day he noticed that new contacts were starting to show up in his new phone—turns out the thief had been adding his friends to the old iPhone and the information was being synced via MobileMe to the replacement unit. He was able to call some of these new contacts, get the thief's contact details, and then reported it to the police. "By the end of the night, I was the proud owner of TWO iPhones," he wrote on eBay, where he's put up the old phone for sale. I'm still not exactly sure how you call someone's friends and inform them that their friend is a thief, but I guess Rob was able to figure it out. 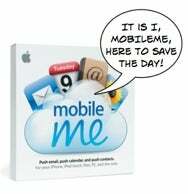 Thanks, MobileMe!